I usually love Spanish wine, and this was a completely new experience at a reasonable price (NOK 89,90/€10,50). It was exact quality for money, much fruit and less body than most Spanish wines I have tasted. 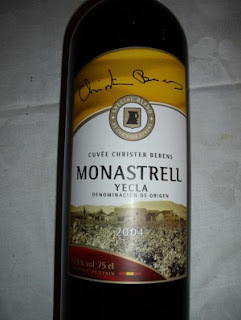 It comes from the region around the town Yecla in Murcia in Eastern Spain, a large wine producing area. It is made from 90% Monastrell or Graciano grape, and 10% Garnacha Tintorera grape. The latter being a grape variety made from crossing Grenache Noir and Petit Bouschet grapes. Recommended for lamb, poultry and cheese. A good piece of advice as it has not the body to match red meat or game. It has a brilliant blue red colour, and a young spicy character based on red berries as blackcurrants and cherries. Lacking body I would hardly recommend it. And would I buy it again? No!